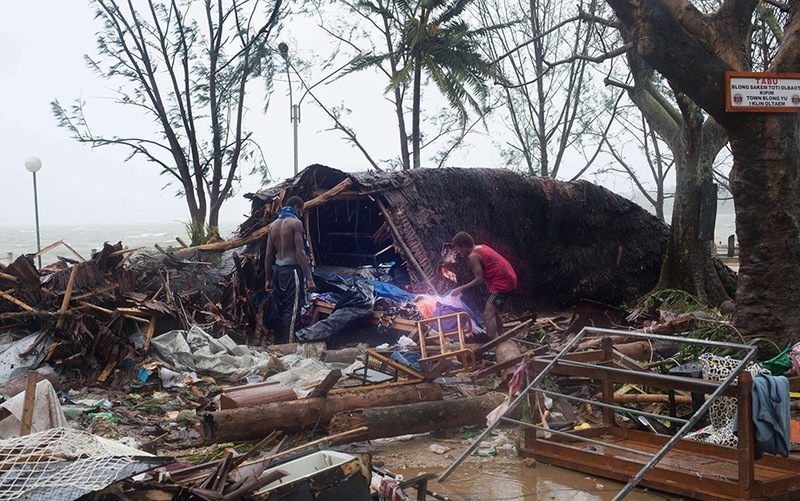 MANILA, 16 MARCH 2015 – The World Health Organization (WHO) in the Western Pacific Region is coordinating response efforts with Vanuatu’s Ministry of Health and other humanitarian partners to bring much-needed health support to the Pacific island country, following the devastation caused by Cyclone Pam. The cyclone ravaged Vanuatu on 13–14 March with winds of more than 250 kilometres per hour and one-metre storm surges. While damage is still being assessed, there are reports of deaths and serious injuries, destroyed homes, and limited or no access to health services, food and clean water in many places. WHO is sending health and emergency response experts with supplies to Vanuatu to assist in the response. WHO is also communicating with the governments of Australia and New Zealand, the United Nations Children’s Fund (UNICEF) and other organizations, to ensure Vanuatu gets the right resources to meet their health needs. WHO and UNICEF are also working with the Ministry of Health to conduct an immunization campaign in response to a measles outbreak that began before the cyclone. Complicating response efforts, the cyclone caused roads blocked with debris, knocked down bridges, and flooding. Electricity is out in many places and phones and Internet systems are down or are unreliable. The extent of the damage continues to be assessed.